A classic radio comedy series was broadcast by the BBC between 1962 and 1977, about two lazy, bungling, incompetent civil servants, “Number One” – Roland Hamilton-Jones (Wilfrid Hyde-White) and later Deryck Lennox-Brown (Deryck Guyler), “Number Two” – Richard Lamb (Richard Murdoch). Lennox-Brown and Lamb gets the job of representing Great Britain at a conference which will divide the surface of planet Venus between the countries of the world. They were chosen especially to fail, since Great Britain doesn’t have funds for the colonization of Venus. Yet, they somehow failed to fail… and instead of coming back with nothing, came back with rights to the whole planet! I tend to think of all the other host countries breathing a sigh of relief every time Glasgow wins the right to host (and PAY for) yet another period of upheaval and disruption for its citizens. The other host cities managed to make it LOOK as if they wanted to win, but were really playing their cards carefully, knowing Glasgow has some sort of mental failure when it comes to seeing the true cost of hosting all this nonsense, and every time Gasgow wins ANOTHER of these events, they all head home, laughing. In a report to the city administration committee, Deputy Leader of the council, David McDonald, said: “This will be the biggest cycling event in the world with over 100 countries represented and over 200 world champions being crowned during the course of the championships. “The huge media interest will guarantee worldwide broadcast coverage delivering massive international profile for both Glasgow and Scotland. I’m not wasting time commenting again. Glaswegian logic – Ye cannae whack it! Brilliant story spotted this evening, and probably a complete lack of understanding of how funding works. While I think some previous posts I’ve made make it clear I’d far sooner see the money being squandered on YET ANOTHER outsider sporting event being parachuted into Glasgow (where I doubt the citizens want it) spent elsewhere, since a mere £7.5 million would restore the People’s Palace Winter Garden AND leave £7.5 million to spare for something else, my past experience in business and winning grants and funding suggests this is not even a starter, let alone an option. The reality is that most of these awards are subject to the funds being used for a specified purpose. If not, they are subject to cancellation, or repayment if they have been misused or misappropriated and used for something else. Sorry, but that’s the REAL world. It shouldn’t come as a great surprise. Then running off with the cash and using it for something that they wouldn’t have a had a hope in hell of getting money for. Ever since a close watch of the spending reports on the Glasgow 2014 Commonwealth Games stupidity, and learning that the organisers are NOT the ones who fund their fun, but the poor mugs of the host city who foot the bill, I’ve been amazed that few realise this, and even fewer object to having their money (taxes) squandered on the promised/claimed benefits they supposedly bring. A few days ago it was revealed that Glasgow was being coerced into pouring some £15 million into another ‘Sport Black Hole’, to host the first World Cycling Championships in 2023. That initial £15 million has already grown by £40 million (so that’s already £55 million, to be blackmailed from partners and the Scottish Government, on the basis that we simply HAVE to host this. This when the council needs to find £500 million for its recent equal pay settlement, and more importantly, £7.5 million to renovate the Winter Garden of the People’s Palace. Those behind this money grab MAY just be beginning to realise the people might not be fooled for much longer. Councillor Archie Graham said: “It is unfortunate congress is next week. This means the council will only have a week to speak to funding partners and the Scottish Government to confirm they will fund the rest of the event. Depute Leader of the Council councillor David McDonald said: “It will benefit the social aspect of the city as well as the economy. The council has been asked to fund £12 million of the event, which is costing £45-50 million overall. You have to love that last quote. More sporty types hold their hands out for Glasgow’s money? As usual, I can only wonder at the reality of the claims made about this (sport) being ‘Good’ for Glasgow, and how I feel like I’m being treated like an idiot when I read some news. Or how many people realise that the organisers behind these sporting jamborees don’t have to pay the host city for the privilege of disrupting it, and its residents, for weeks/months/years as it makes ready for them to have a whole week or two of fun at the host city’s expense. The host coughs up the funding to attract them, and then pays for new venues, modifications to existing venues, any new things (like athletes’ villages), and all the organisation and management – THEN has to supply mindless ranks of thousands of unpaid VOLUNTEERS to staff them for the duration, and they’re daft enough to do it for expenses (maybe). Are these numbers produced by people/organisations promoting this stuff (and recipients of work/cash), or are they independently audited figures which take into account ALL the costs? A TRUE reckoning might be enlightening (and maybe shocking). But can’t find less than £10 million to preserve our own assets, such as Winter Gardens. And one actually right beside a holy sporting venue. In the last decade Glasgow has invested more than £200m in its sporting venues attracting world-class athletes and international supporters and spectators. Since 2009, attendances at Glasgow Club sports facilities have increased by more than 50%, meaning more and more adults are taking positive steps to improve their health and wellbeing. In addition, the number of junior members attending sports clubs across the city has more than quadrupled, demonstrating children are increasingly becoming active in sport at an earlier age. Sport also adds huge value to the city’s economy contributing approximately £367m and employing around 10,000 people across the sector. After all the self-praise these things generate, and all the patting of backs for those involved, we get all those apparently wonderful numbers. 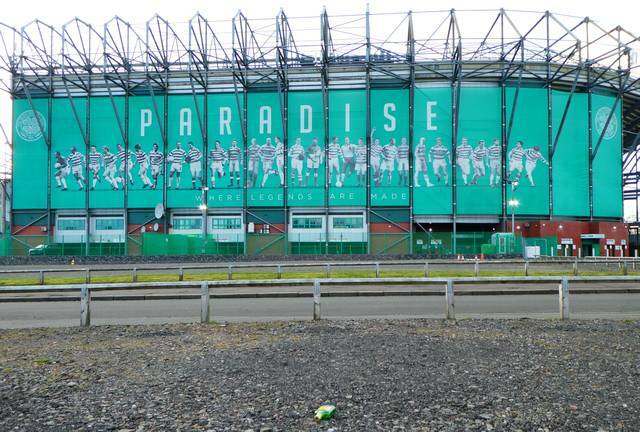 Celtic contribute around £165m to Scotland’s economy annually – more than the 2014 Commonwealth Games – according to a report commissioned by the club. I should add I don’t care about sport/Celtic/events, BUT I do care when I read stuff that makes me feel as if I am being treated like an idiot, which I do whenever I read about these endless bids for sporting events, and the ‘magic’ numbers relating to their finances and after effects. Maybe I should be indulging in some of the Buckfast seen below when reading those figures. I never really appreciated the detail of the Arctic Convoys until I did a little of my own research for a post, then realised I’d missed a lot with regard to this story. Sadly, while education about this wartime effort is growing, this is only happening as the last few survivors have grown very old, and their numbers are dwindling. There has always been some sort of memorial to those involved, but not a proper, formal museum. However, ongoing efforts to create such a facility are moving towards a successful conclusion, and I noticed news of another award which the project will benefit from. A project dedicated to World War Two’s Russian Arctic Convoys has received £72,820 from the Scottish Land Fund. The Highlands’ Russian Arctic Convoy Project (RACP) will use the money to buy a former butcher’s shop in Aultbea for a new exhibition centre. The nearby Loch Ewe was a gathering point for many of the convoys. The Arctic Convoys transported four million tons of supplies and munitions to Russia between 1941 and 1945. More than 3,000 Allied seamen lost their lives to the freezing conditions and attacks during the trips to ports in the Arctic Circle after Germany invaded the Soviet Union in June 1941. Intriguing to see something come good, and that the Glasgow Science Centre might be melting in what was referred to as a recent heatwave (when the gloop under the metal cladding dribbled out in the summer heat), and that there no longer seems to be any need to reduce its staff to try to reduce costs and keep it open, or even just keep it. Science centres in Glasgow and Dundee have been awarded more than £4.3m to widen their reach to local communities. Glasgow Science Centre will receive £2,876,401 to develop its indoor and outdoor exhibition spaces and facilities. The funding is the largest single investment in Glasgow Science Centre since it opened in 2001. The money will fund the centre’s Connect project. It’s funny seeing this, as I just made it back to the area for the first time in years, although not to the Science Centre itself. I was lucky enough to get an invite to a tour around the place just before it opened, which was sort of good and bad all in one. Good in the sense that such centres can introduce many people to science. Bad in the sense that it’s all pretty basic, and mostly aimed at kids. So I’ve never wanted to go back (oh, maybe not entirely true – the planetarium was not completed, and I would probably want a look at it to complete the package). I used to visit the London Planetarium – but not for the planetarium display, but that’s another story. But I’m glad to see it win some money and stay alive – unlike The Big Idea, still lying derelict in Irvine. Creation of a unique outdoor learning space and a new exhibition gallery are among planned improvements, together with better facilities and development of the science centre’s community-based learning programme. Over the next few months, the team at the centre will work with stakeholders to source the match funding required as part of the Inspiring Science Fund and plan the implementation phase of Connect. Visitors will start to see changes from spring 2019 with the addition of the Changing Places Toilet.